One of the challenges with the unbuilding project is that of protecting the environmentally sensitive areas that bound the Cooper River. Roadway removal on the Mt. Pleasant side is a major challenge as there are large wetland areas. 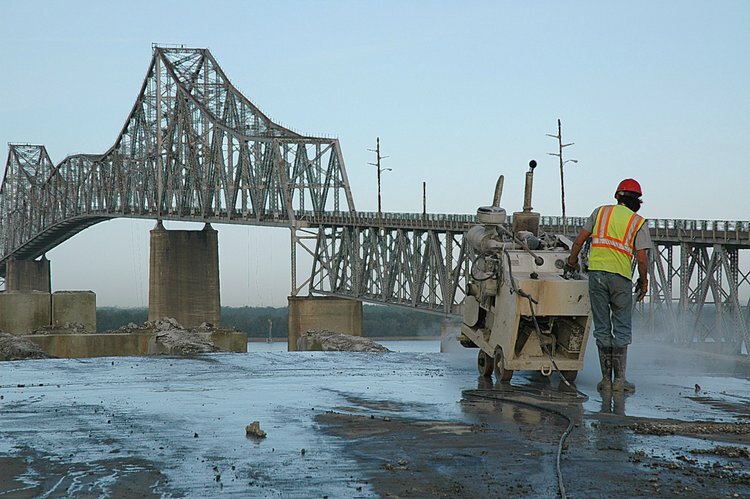 As I understand the traditional process, one uses a jack hammer to break up the roadway, with the debris falling into the water below. I learned that there are actually two classes of structures used in the Pearman Bridge. 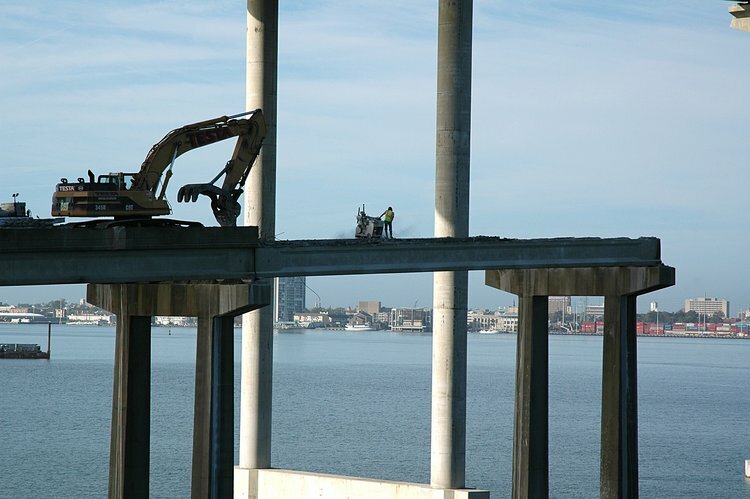 From the water's edge, concrete girders are supported by concrete piers with a concrete pier cap. 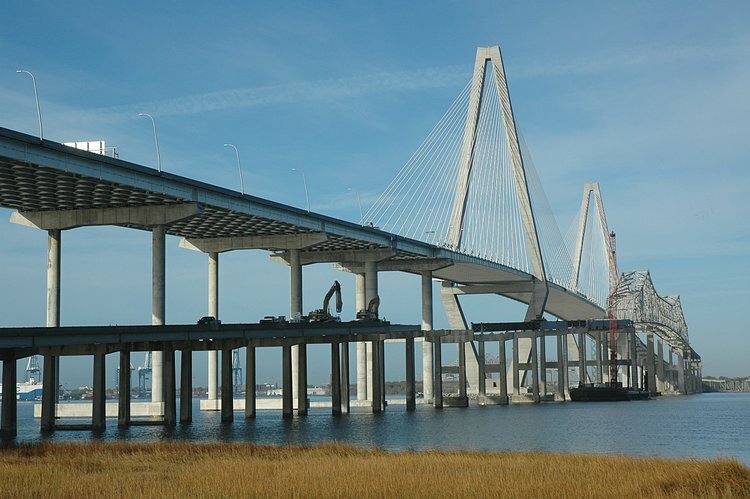 However steel girders are used in the bridge section that runs parallel to the cable-stayed part of the Ravenel Bridge. 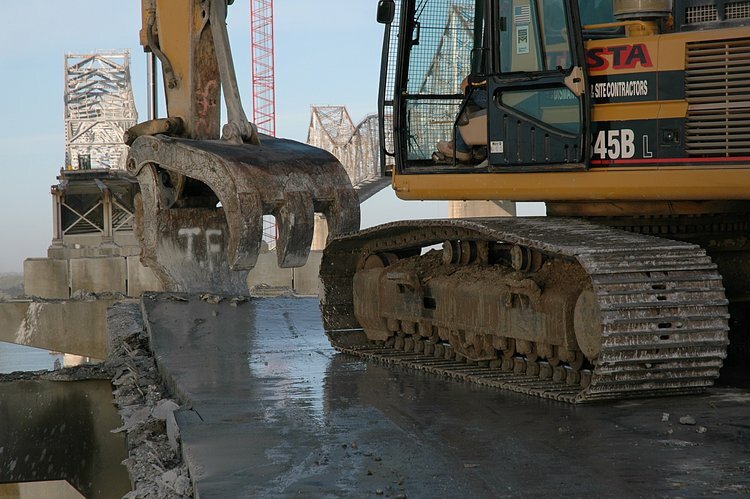 Using a jack hammer to break up the concrete roadway would result in concrete fragments falling into the water below, sinking in the mud bottom and creating a major challenge for removal. 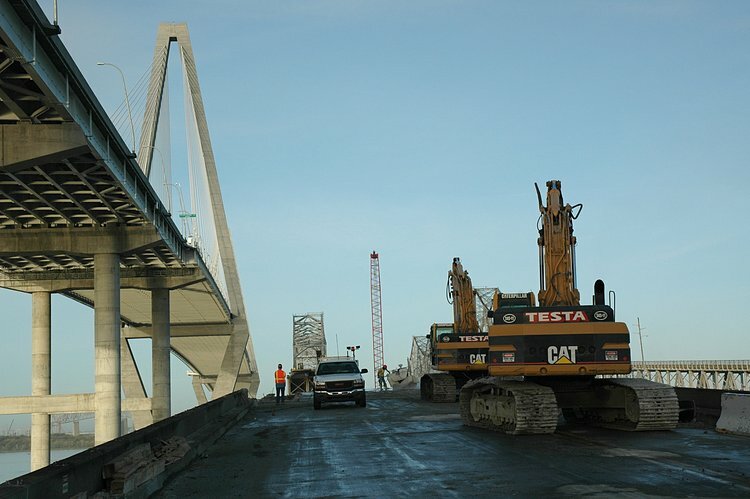 Bob's team developed a strategy of hammering a line in the roadway directly over each girder. The result was the only a minimal amount of roadway fell into the river below. 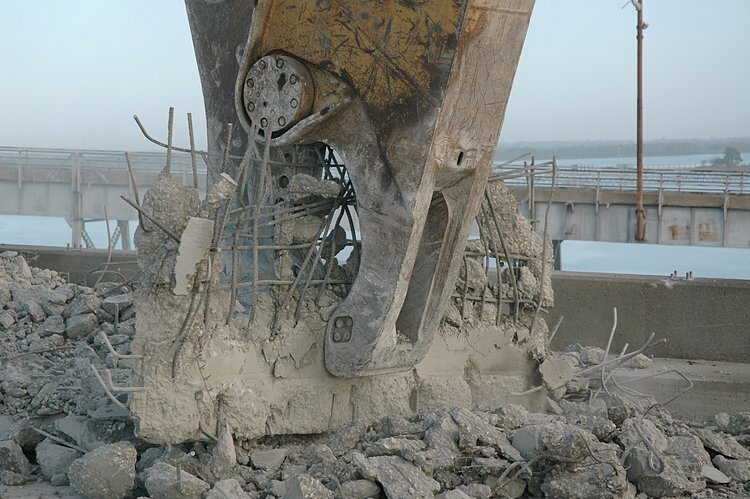 As they completed the steel girder section, a new challenge arose - how to again avoid dropping concrete debris into the shallow riverbed below? Earlier, this week I watched removal of the concrete girders and learned from Bob that his team had developed a new technique for removing roadway segments over the concrete girders. 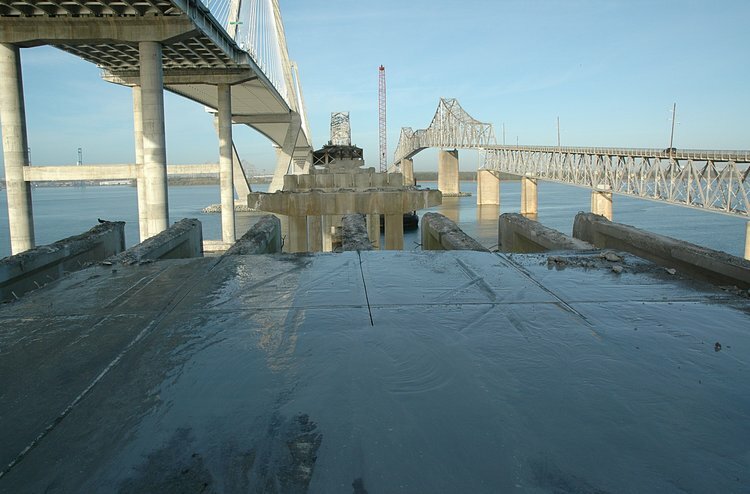 To form the roadway, concrete is poured over a grid of rebar that adds strength to the concrete. The rebar grid is stabilized by coupling it to rows of rebar loops that run the length of the girder. 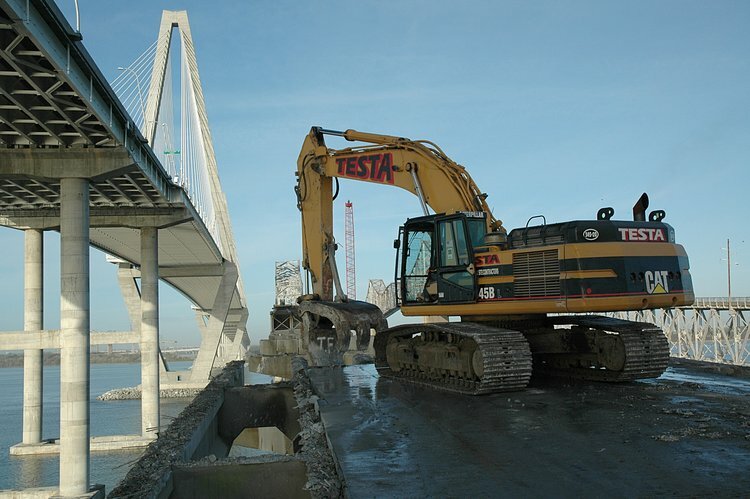 The unbuilding challenge is to remove the roadway while minimizing debris that falls into the river below. 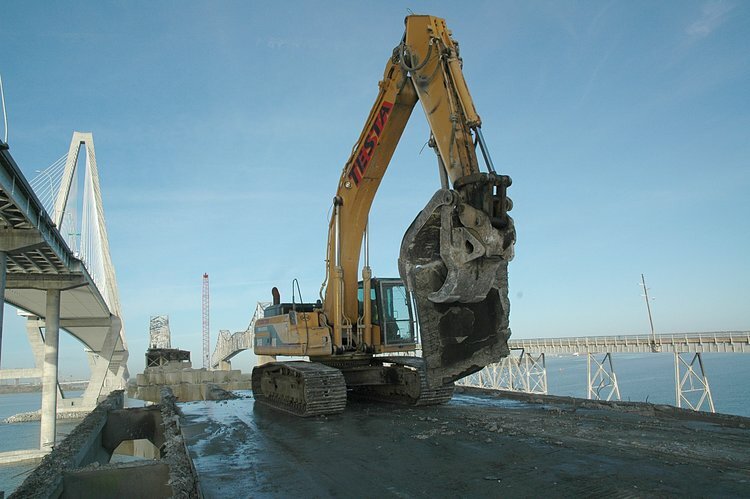 Bob's team worked out a strategy that starts with removal of a length of roadway shoulders. Then they cut the roadway into segments (approximately 4' x 10'). First a lateral line is cut perpendicular to the shoulders of the bridge. Then intersecting longitudinal lines are cut. 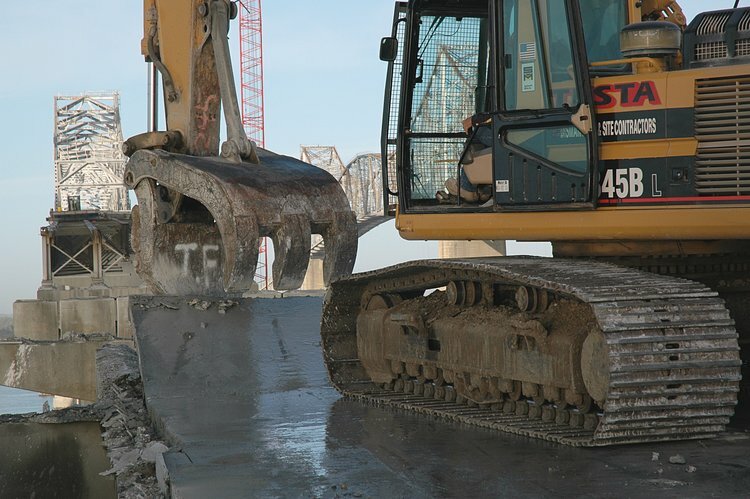 By cutting the longitudinal lines along the center of the concrete girders, the rebar strength is compromised and the roadway segment can be readily extracted. 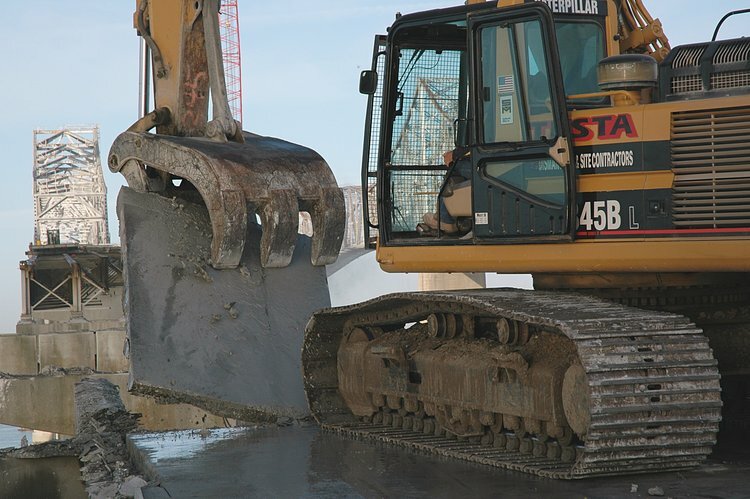 Jack Foley uses a grapple to pick up each section of roadway and move it to his work area. 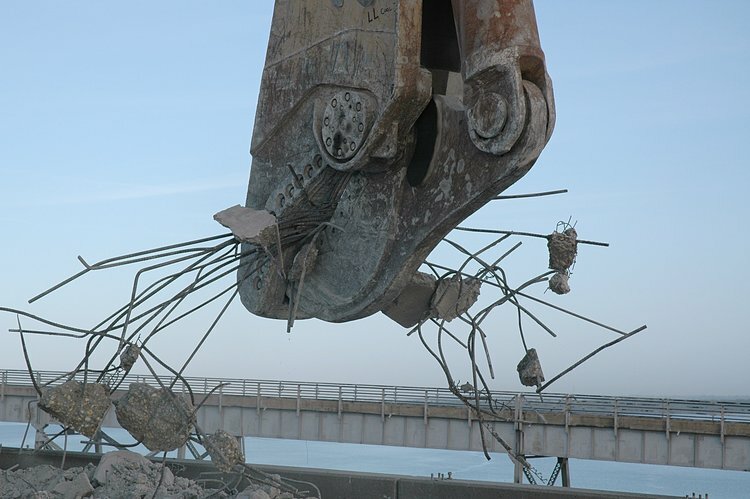 There, with a grapple he breaks the concrete and thus freeing the rebar. The rebar is accumulated and recycled and the concrete is harvested for a reef transplant procedure. 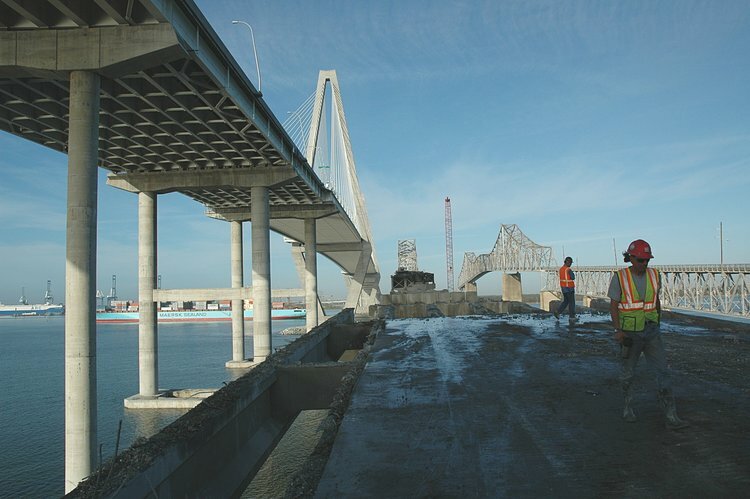 Here is the worksite - the east Ravenel tower to the left, a concrete cutting machine, grapple and shear. Because of safety issues, capturing these images was a challange. Consequently I used a zoom lens which foreshortens the apparent distances. Thus the apparent distances are shorter than the real distances between workers and unprotected boundaries of the work area. Here, Ted is making the longitudinal cuts along the north side. reaches under it and gently lifts it up. He then rotates his 345 and moves the roadway segment for later processing. So with all this cutting, I asked Ted about the lifetime of one of his diamond saw blades and the answer was interesting. 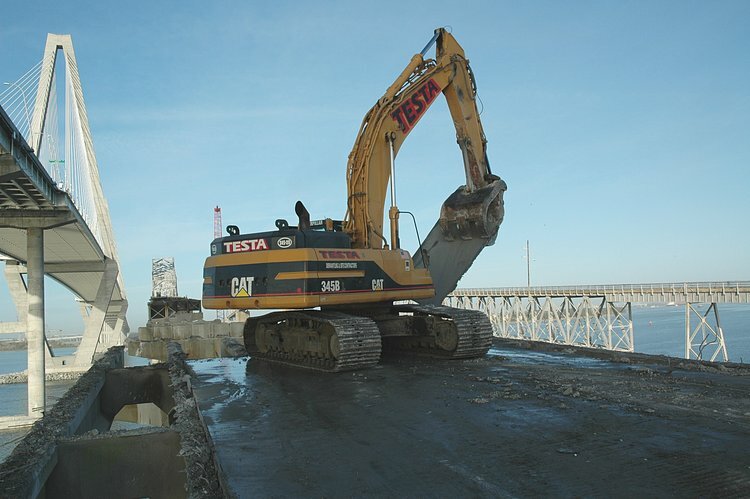 Ted gets about 700 feet of cutting done over the concrete girders and about 1500 feet when cutting near the main span. Why? 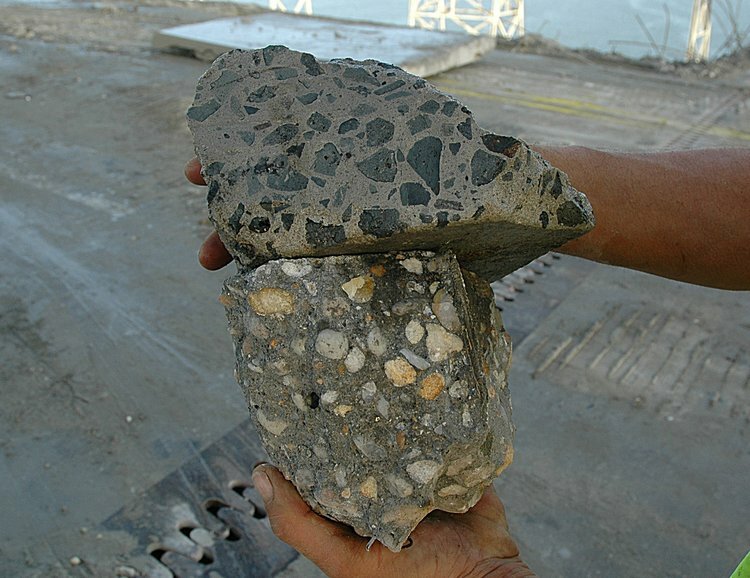 Look at the two concrete samples below. The lower sample uses quartz aggregate and is heavier than the upper sample that uses some sort of black aggregate. (Anyone know what the black rock is?). 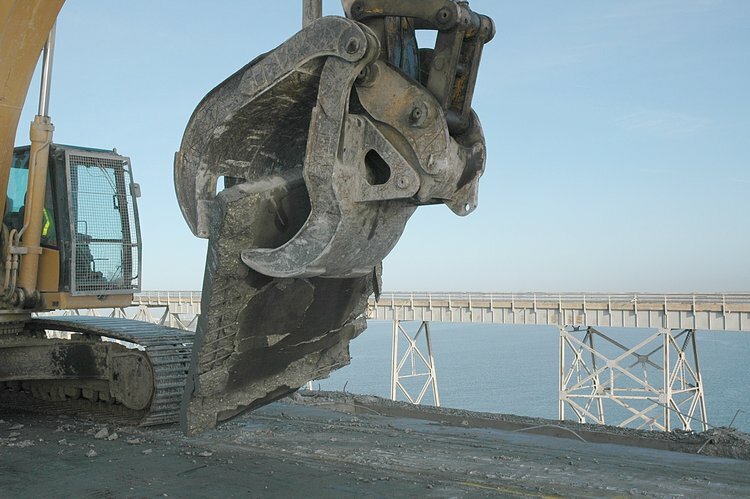 While Ted is cutting, Jack is busy eating roadway segments with is shear. By breaking the roadway with his shear - but not cutting it, the rebar is freed. More surgical skills! 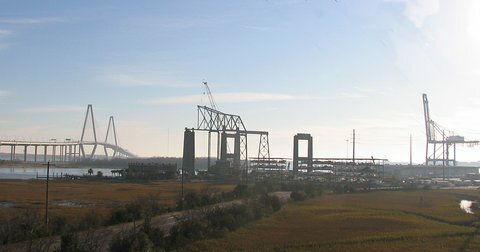 Once all the roadway is removed between a pair of piers, the concrete girders are harvested see girder harvesting from a few days ago - and then the process starts over again. Nice work!